At the time of a starting canonical ArM5 Saga, the so-called “Isle of Barthelasse”, situated in the main stream of the Rhone at the level of the Avignon crossing / Pont St Benezet was most likely composed of a number of shifting swamping islets similar to the small island depicted in the image. The original concept for the geographical precursor covenant to the Coenobium, “Sub Pontem“, was a collection of reclusive magi living beneath the swampy islands beneath the main bridge and on moored barges served by a rag tag turb of outcast river folk. The laboratory barges and Nicodemus (himself a nod to another famous wizard that was found beneath a bridge) remained in the final draft but some of the more “gypsy” elements were left behind in the transformation to the more urbane Jerbiton covenant. 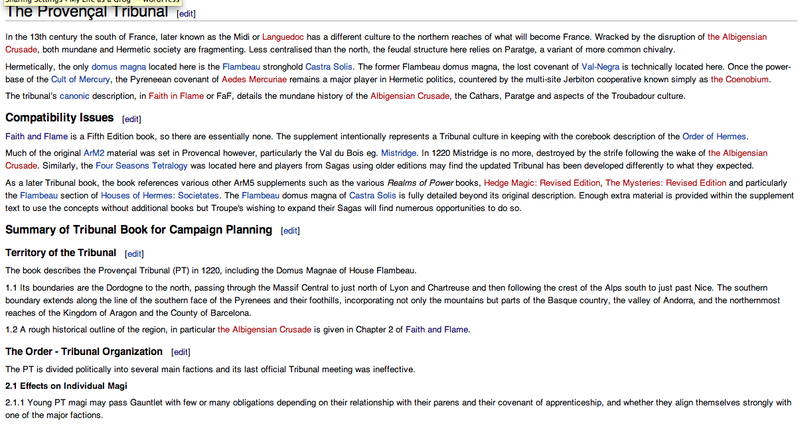 Now that Faith and Flame has been out for a few weeks, I’ve had a chance to start to update the Provencal entry on the Project Redcap wiki on the page entitled: Which Tribunal to Choose? – The Provencal Tribunal. This very useful page on the wiki briefly summarises the various Tribunals from a play potential perspective, using where possible a template developed back about a year ago now. The idea grew out of a prolonged discussion thread on the Atlas Games Forums about Tribunal Books, which now provides (incomplete) summaries of the various regions of Mythic Europe (and beyond) that a Saga could potentially be set. One of the comments that led the discussion was the perception that all the existing Tribunal books at that time had some unusual quirk or cultural aspect that dominated the Tribunal and the way magi interacted. During the writing of Faith and Flame we intentionally tried to keep Provencal “vanilla” ie. as close to the default Hermetic society portrayed in the ArM5 corebook. This concept is briefly outlined in broad terms in the insert on page 22 of Faith and Flame, “A Tribunal for Every Magus?”. The philosophy behind this was to provide a “default” setting, which would therefore make it easy to start a beginning Saga and to allow ideas and material from supplements from previous editions (particularly ArM2) to be utilized with only minor need for conversion (albeit with a 23 year jump in timeline due tot he different canonical starting dates between editions). By updating the page I hope that the information provided will prove useful for Troupes considering starting a new Saga and make choosing Provencal as their initial setting more likely.